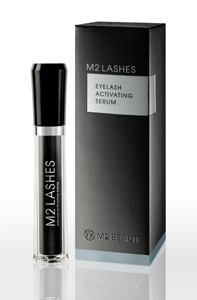 M2BEAUTÉ introduces its M2LASHES Eyelash Activating Serum and Revitalising Gloss. This highly effective duo contains active ingredients and nutritional components that promote the fullness, length and strength of lashes along with condition, definition and shine. If applied daily, lashes not only become longer, fuller, stronger, healthier, shinier and more defined, but may also acquire a darker tone and harmonious curl. The first visible results claim to be seen after six to eight weeks with maximum results achieved by week 16. The key active complex MDN is a prostaglandin analogue, which in an alternative form has its use in ophthalmology. This modified and carefully dosed ingredient compound stimulates the eyelashes at their roots increasing the number of lashes, extending the eyelash growth phase and delaying the cycle of lash loss. In keeping with the M2BEAUTÉ company philosophy, the active serum contains only ingredients scientifically proven to be safe and effective. The Eyelash Activating Serum does not require a prescription and does not contain any dubious ingredients. In addition to the nourishing, moisture regulating ingredients Panthenol (vitamin B5) and Hydrolysed Collagen, the Revitalising Gloss also contains Copper Tripeptide 1. This innovative active ingredient creates a healthy skin environment, increases collagen production and combats free radicals keeping the eye area healthy and supporting hair growth. Its unique ingredients not only measurably support growth but also lend the lashes noticeable definition and an expressive silky shine. M2LASHES is available online at http://www.m2beaute.com/ and has now launched into Harrods exclusively until the New Year. In 2011 they will role out to stockists nationwide. M2LASHES Eyelash Activating Serum is priced at £120.00 for 5ml and the Eyelash Revitalising Gloss is priced at contains £45 for 8ml.